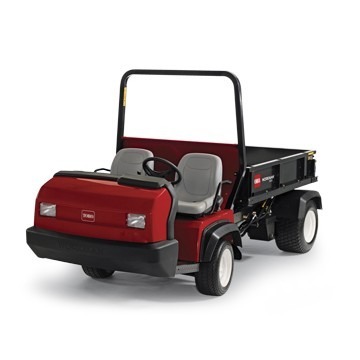 You can’t get more hauling capacity, versatility, or bang for your utility vehicle buck than the new Toro® Workman®. 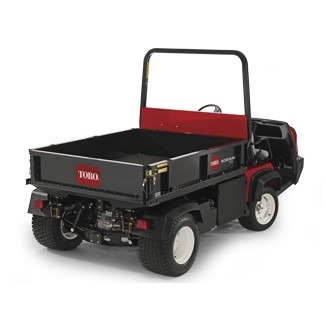 With an I-beam axle that’s seven times stronger than a comparable tubular design, a bed that hauls up to 35% more than the competition, and an electronic fuel injected engine that makes every gallon go farther, it’s the highest performing utility vehicle on the market today. The Workman® HDX-D vehicle provides total payload capacity of 1,3131286 kg. Liquid cooled diesel engine provides excellent low end torque and is EPA Tier 4 emission compliant and B20 biodiesel ready. The Workman® can perform a variety of work tasks beyond hauling and towing with attachments such as a 166 gal (757 l) Sprayer, Vicon® Spreader, 1/3 Vertical Platform Lift, Patriot® Aerial Lift and Topdressers. Numerous accessories enhance versatility including Canopy, Folding Windshield, Various Light Kits, Deluxe Hard Cab, Various Flatbeds, 4-Post ROPS, Automatic Tailgate Release, Rear PTO and others.